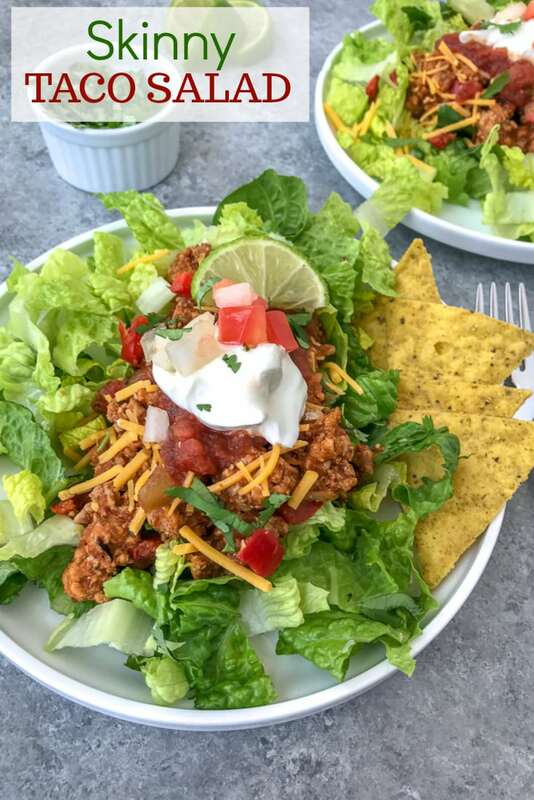 This Skinny Taco Salad is made full of flavor! 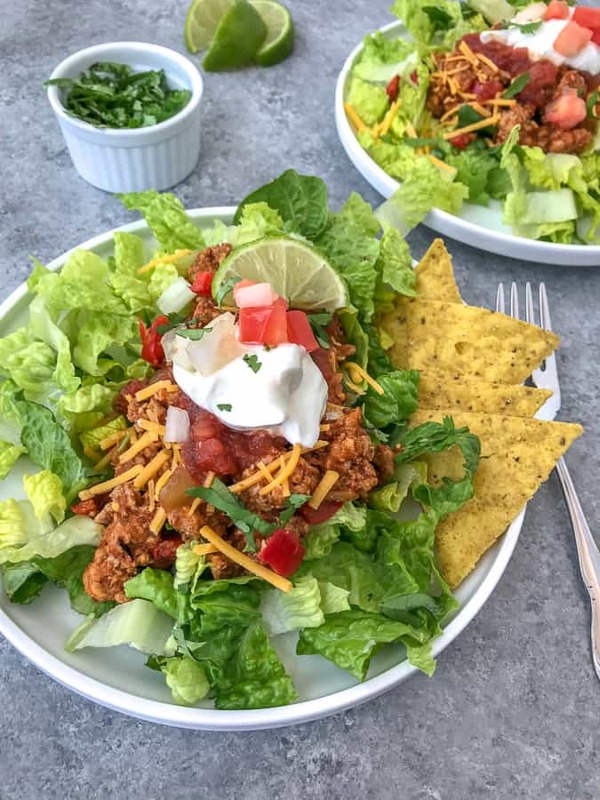 It is a HEALTHIER version of traditional tacos, loaded with lean ground turkey, shredded cheddar cheese, pico de gallo, salsa, and plain greek yogurt overtop a bed of crisp romaine lettuce. 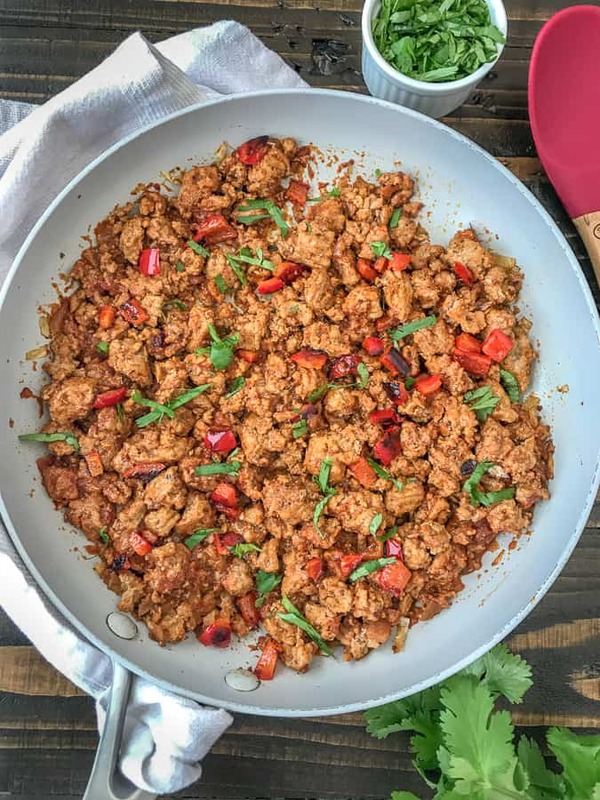 This makes for a simple, quick and delicious meal prep option! If you’re a fan of tacos and salads, then you’re in the right place! If you’re looking for an easy and quick recipe to meal prep, then you’re in the right place, too! This recipe is not only a great light lunch or dinner option, but it is also a great to-go kit to throw together for your weekday lunches. Bonus? It’s a healthier take on the traditional Taco Tuesday that we all know and LOVE. Win win! 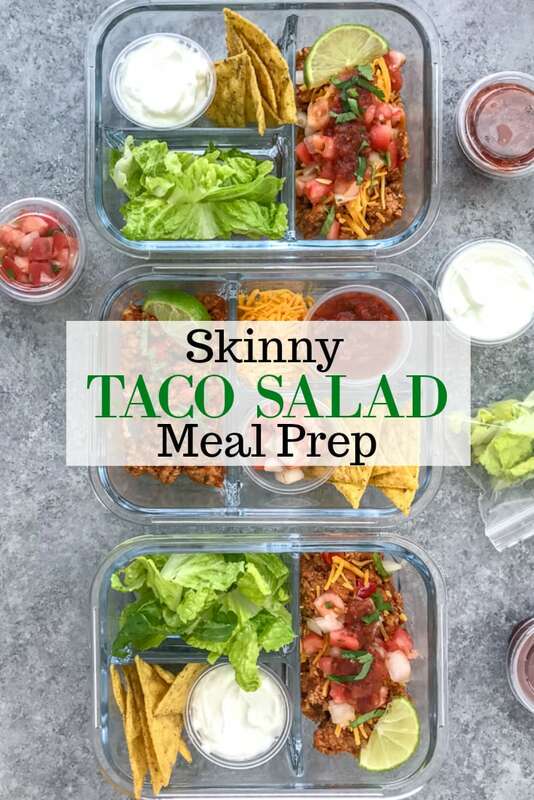 These taco salads are the perfect blend of healthy and indulging. They are full of vegetables, protein, and tons of flavor. All while being on the lighter side of things. The portions make for a filling lunch option and not an overindulging one. Which is perfect if you’re trying to portion control. Pair this Skinny Taco Salad with my scrumptious, easy-to-make Avocado Corn Salsa! So good! Substitute ground chicken for the ground turkey. For added protein: add in black beans or pinto beans. Don’t have bell peppers? Sub with mushrooms or corn! Substitute the toppings listed above for any of your favorite taco toppings. If you’re missing the crunch of a hard taco shell, break one up and serve it overtop of the salad. Or serve with a few tortilla chips. The beauty of this recipe is that all you need is a cutting board and knife and a pan to cook this in! 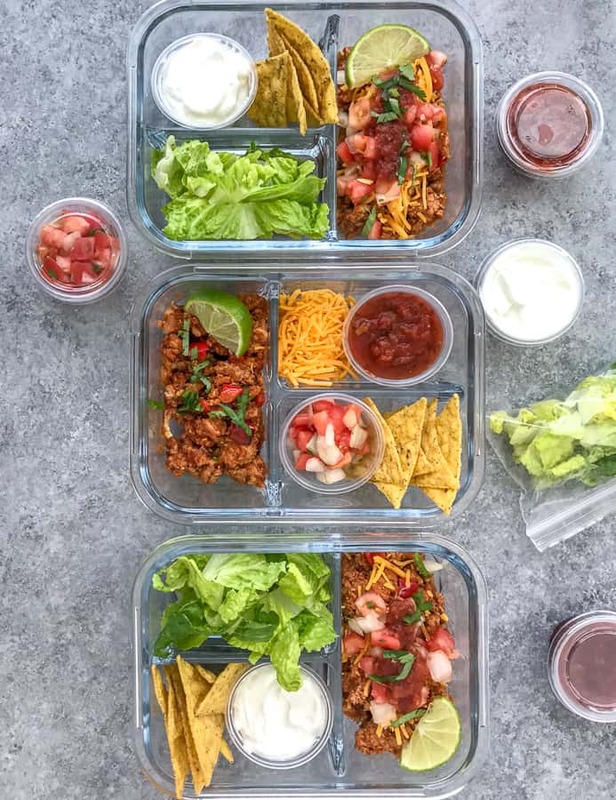 Enjoy the salad immediately or divide the ingredients between four divided meal prep containers to have for your lunch for the next few days. Everything is divided into their own little containers and bags – which I highly recommend. 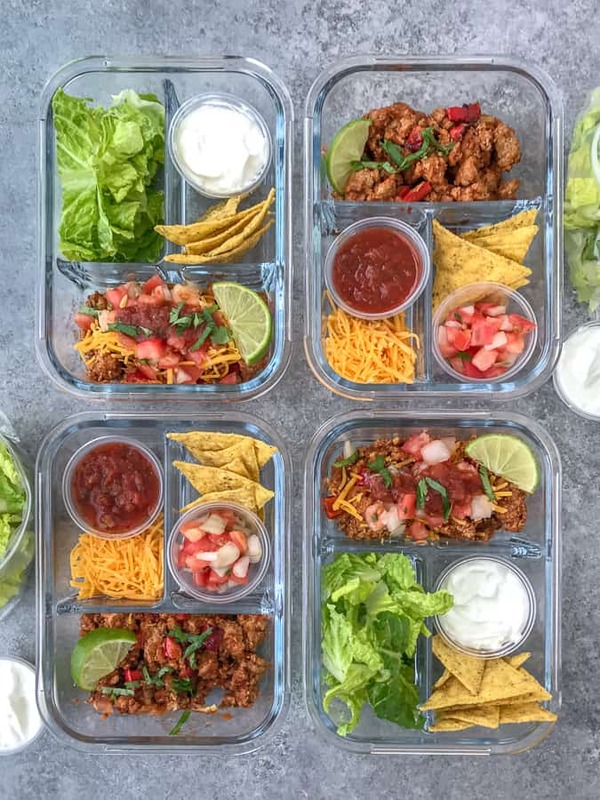 This will prevent the meal from getting soggy and when it’s time to re-heat the ground turkey, it’s completely separate from the salad, chips, and toppings. I use re-useable dressing containers to separate my pico de gallo, greek yogurt, etc. Re-useable Dressing Containers – perfect for dressings, sauces, cheese, etc. Divided Glass Lunch Containers – great to keep certain items separated that you don’t want mingling. Glass Lunch Containers – one compartment that works perfectly for an entire meal (such as meats, vegetables, potatoes) that needs reheating. Cutlery Set – perfect for on-the-go and it comes with a holder so you won’t lose the silverware! 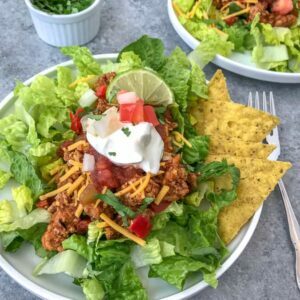 Skinny Taco Salad - comes together quickly and easily, all in one pan. Great low-carb, high protein light lunch option or to make ahead for meal prep! Place a large nonstick pan over medium heat and add the olive oil. Once heated, add the onions and peppers. Sauté 3-4 minutes or until the onions are translucent. Add the minced garlic and cook 1 minute. Add the ground turkey, breaking it apart with a wooden spoon as it cooks. Once it is halfway cooked, add the seasonings, stir well and cook until browned. Add in salsa and tomato sauce, stirring well to fully incorporate. Lower the heat to a simmer. Cook for 2-3 minutes. 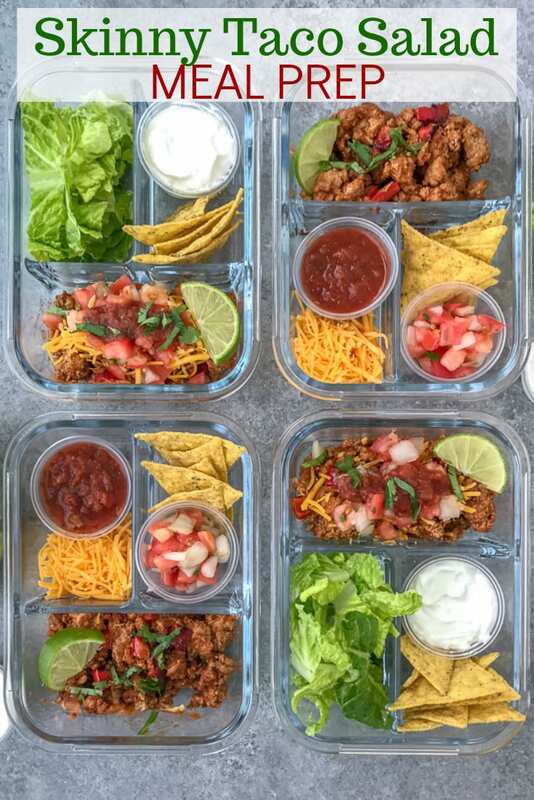 Remove and divide the meat and sides into four separate meal prep containers, sandwich bags, and dressing containers.